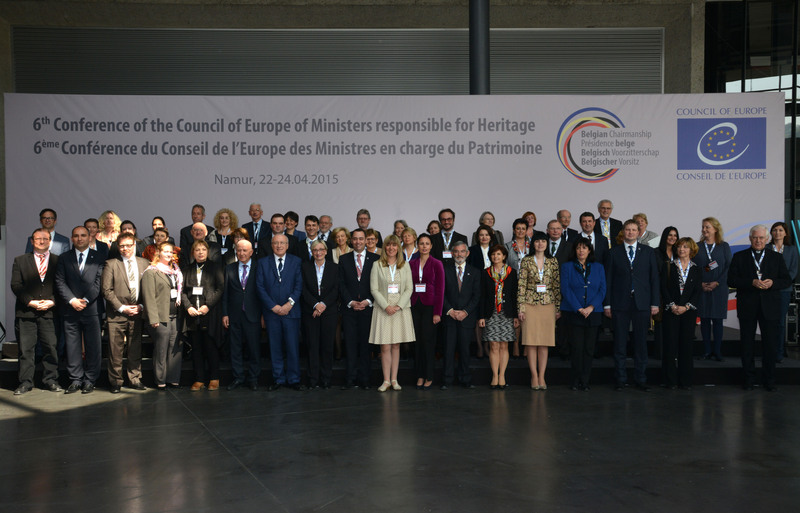 On 24 April European ministers responsible for cultural heritage have adopted guidelines for a European heritage strategy at their 6th conference entitled “Cultural heritage in the 21st century for living better together. 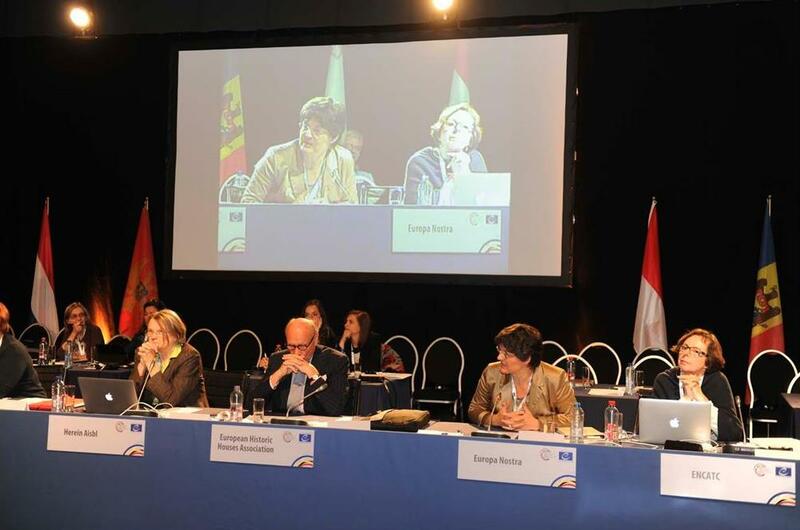 Towards a common strategy for Europe.” Held from 23-24 April in Namur, the conference was organised in the framework of the Belgian Chairmanship of the Committee of Ministers of the Council of Europe. The purpose of the event was to define the conditions for elaborating a strategy for heritage in Europe 21st century, to protect and foster cultural heritage, promote good governance and participation in heritage identification and management, and meet the challenges facing heritage in the matters of citizen participation and in economic, social and environmental contexts. Furthermore, the conference was held to contribute to the development of a society based on the fundamental values of the Council of Europe, promoting mutual respect and recognition of diversity and taking into account the quality of life of its citizens as an expression of human rights. 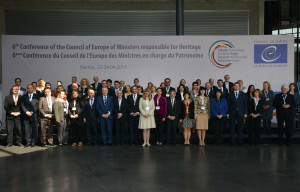 The Conference gathered Ministers of the States party to the European Cultural Convention, the States of holding observer status with the Council of Europe or the Steering Committee for Culture, Heritage and Landscape (CDCPP), the Congress of Local and Regional Authorities, and representatives from the European Commission, UNESCO, and civil society. Members of the Cultural Heritage Counts for Europe were among the invited speakers, each representing their institution: Sneška Quaedvlieg-Mihailović, Secretary General of Europa Nostra; Brian Smith, Secretary General of Heritage Europe; and Prof. Claire Giraud-Labalte, Chair of the ENCATC Thematic Area Understanding Heritage and ENCATC Ambassador. In her address to the Ministers, speaking also on behalf of other members of the European Heritage Alliance 3.3. Sneška Quaedvlieg-Mihailović emphasised the importance of a stronger cooperation and policy coordination between the Council of Europe and the European Union with regards to cultural heritage. She also thanked the Belgian Chairmanship for including the civil society so prominently in the preparations of the Conference and also in the deliberations during the Conference, allowing for a real open and constructive dialogue between the civil society and policy-makers. As a cultural heritage expert, Claire Giraud-Labalte was also invited to participate in conference’s preparatory meetings. Addressing the conference participants on 23 April, Claire Giraud-Labalte stressed for the need for education and training in heritage management and for and collaborative methods to address challenges faced in the sector. “Training is a key factor for the implementation of this European heritage strategy on condition of rethinking in a changing Europe. Training, initial and throughout life, must give way to a better knowledge of Europe in all its dimensions, fostering intercultural dialogue respectful of diversity and citizen participation in projects with creative methods and done in a collaborative way. This means to promote all approaches (intellectual, cognitive, sensory, experimental, etc.) in European heritage so that users derive pleasure and pride. By being more aware of its value, citizens adhere better to the efforts made in its favour,” said Prof. Giraud-Labalte. In their closing session, the Ministers adopted the Namur Declaration, which defines the objectives and priorities for a future common European Heritage Strategy which they strive to adopt by the end of 2016. The Ministers call for this Strategy to be developed in close cooperation with the European Union, UNESCO and other international stakeholders and to offer a vision and 10-year framework for actions and to promote a shared and unifying approach to heritage management. They also want four priorities to be given due attention: the contribution of heritage to quality of life and living environment, its contribution to Europe’s attractiveness and prosperity, education and lifelong learning, and participatory governance in the heritage field. In addition to the Declaration, the Ministers also adopted the Namur Call condemning deliberate acts of heritage destruction and advocating the need to reinforce European cooperation to prevent both the destruction of heritage as well as the illicit trafficking of cultural property. At the end of the Conference, Europa Nostra congratulated Minister Maxime Prévot (Vice-President of the Walloon Government who is also Minister for Public Works, Health, Social Affairs and Heritage as well as Mayor of Namur) who acted as the highly committed and most inspiring Host and Chair of the entire Conference, and invited him to attend the Cultural Heritage Counts for Europe concluding conference to be held on 12 June 2015 Oslo.